KYOTO KNIVES : Much more than a mere knife, it is a precision cutting instrument. Treat this Japanese chef knife well and it will reward you with a lifetime of service. SAMURAI SERIES : The Kyoto Samurai series masterfully achieves impeccable knife balance. Each knife, fashioned of the highest quality materials, is the product of a meticulous 60-day artisanal production protocol. The steel is a product of Japan a nation that prides itself on the manufacture of professional-grade cutlery used in esteemed kitchens the world over. The final product is a premium quality instrument fit for the utmost professional. DAMASCUS STEEL : Forged from professional-grade Japanese VG-10 steel fused with high-carbon SUS410 stainless steel folded over repeatedly, hand-polished by veteran craftsmen employing the traditional 3-step Honbazuke method that results in a razor-sharp blade at an unprecedented 8-12° angle allowing for a smooth-as-silk cut. KYOTO DIFFERENCE: Painstakingly 60 day production time per Samurai Series knife. Extensive mulit-stage quality control procedure ensures an incredibly satisfying investment to your culinary arsenal. LOWER THE ANGLE, SHARPER THE BLADE: Each knifes goes through a proprietary handcrafted process that strengthens the steel which allows it to have one of the sharpest blade in the market. This process makes our blade angle to be between 8-12 degrees. BETTER than typical chef knives that have a 15-20 degree angle. JAPANESE STEEL: Japanese steel is the best in the world. They demand perfection. Compared to the cheaper German steel, our Japanese steel is stronger. And because of our proprietary manufacturing process our kitchen knife holds an edge over the competition. A durable chef knife means less work for you. From professional chefs to households that demand quality, our chef knife will not let you down. LIFETIME WARRANTY: We stand behind our products and will fully refund any Kyoto Knife. Look at our seller profile. Our customer service is one of the best. This allows you to buy in confidence without worrying about product quality. As a SMALL BUSINESS we know we have an uphill fight to grow our brand. We are here to stay by working harder than the competition. HANDLE: Made with professional grade G-10 Garolite that is hand-polished so it melts into your hands. Unlike wood handles, ours are built for durability and comfort while smaintaining a modern style. The Garolite prevents foods from embedding into the handle which becomes a health hazard. RESPECT YOUR WALLET - Competitors at retail stores sell their damascus chef knives for $200+. That high price is there for the middleman. We cut out the fat and sell directly from our manufacture. We push the savings to you! Color: 9.5 Inch Blade with Japanese VG10 Steel. Lifetime Warranty. 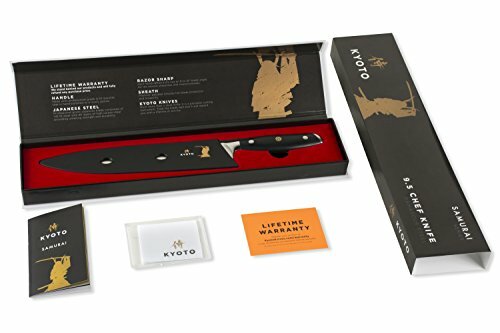 If you have any questions about this product by Kyoto Knives, contact us by completing and submitting the form below. If you are looking for a specif part number, please include it with your message.